Washington Square Press, 9781476712826, 352pp. Elsie Porter is an average twentysomething and yet what happens to her is anything but ordinary. On a rainy New Year’s Day, she heads out to pick up a pizza for one. She isn’t expecting to see anyone else in the shop, much less the adorable and charming Ben Ross. Their chemistry is instant and electric. Ben cannot even wait twenty-four hours before asking to see her again. Within weeks, the two are head over heels in love. By May, they’ve eloped. "Touching and powerful...Reid masterfully grabs hold of the heartstrings and doesn't let go. A stunning first novel." "You'll laugh, weep and fly through each crazy-readable page." "Moving, gorgeous and, at times, heart-wrenching. Taylor Jenkins Reid writes with wit and true emotion that you can feel. Read it, savor it, share it." 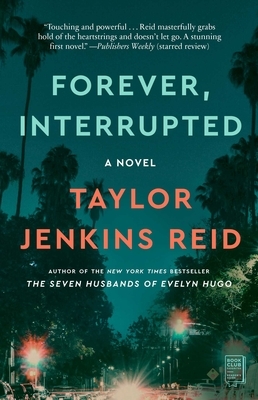 "Sweet, heartfelt, and surprising, Forever Interrupted is a story about a young woman struggling to find her way after losing her husband. These characters made me laugh as well as cry, and I ended up falling in love with them, too." "This beautifully rendered story explores the brilliance and rarity of finding true love, and how to find our way back through the painful aftermath of losing it. These characters will leap right off the page and into your heart." "Readers looking for a romance with a twist won't be disappointed"
"Taylor Jenkins Reid offers an entirely fresh and new perspective on what can happen after the "happily ever after." With characters who feel like friends and a narrative that hooked me from the first page, After I Do takes an elegant and incisively emotional look at the endings and beginnings of love. Put this book at the top of your must read list!" "As uplifting as it is brutally honest—a must-read." "Taylor Jenkins Reid writes with ruthless honesty, displaying an innate understanding of human emotion and creating characters and relationships so real I’m finding it impossible to let them go. After I Do is a raw, unflinching exploration of the realities of marriage, the delicate nature of love, and the enduring strength of family. Simultaneously funny and sad, heartbreaking and hopeful, Reid has crafted a story of love lost and found that is as timely as it is timeless."